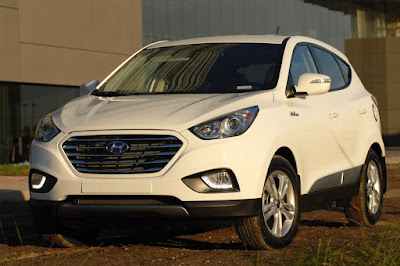 The current Hyundai Tucson Fuel Cell was the first of the recent crop of hydrogen fuel-cell cars to go on sale; its first U.S. deliveries started back in June 2014. Since then, The Toyota Mirai and Honda Clarity Fuel Cell sedans have also become available in the U.S., though all three makers limit sales to specific regions of California. 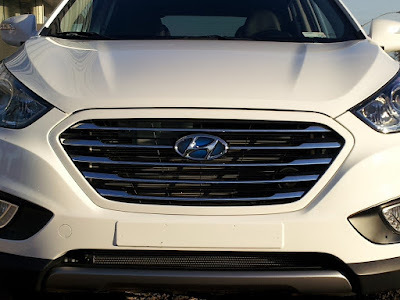 Hyundai has also transitioned the gasoline Tucson to a new platform, while keeping the hydrogen fuel-cell model on the previous-generation platform. Now it appears that Hyundai is planning a second-generation fuel-cell crossover, with a new and improved powertrain. This new Hyundai fuel-cell model will arrive within two years, and will have 30 percent more range than the current Tucson Fuel Cell, according to a recent Nikkei report. The Tucson Fuel Cell has an EPA-rated range of 265 miles, putting it well behind the 366 miles of the Honda Clarity Fuel Cell, and 312 miles of the Toyota Mirai. The next-generation model will arrive in January 2018, supposedly priced at around $50,000. A 2018 launch date was mentioned by Hyundai eco-vehicle development director Ahn Byung-ki, who said it would coincide with the Winter Olympic Games in Hyundai's home country of South Korea. The Pyeonchang Games will give Hyundai a chance to show off its fuel-cell technology, he noted. All reports so far indicate the next Hyundai fuel-cell vehicle will be another crossover like the current Tucson Fuel Cell. But last year, Hyundai fuel-cell research boss Sae-Hoon Kim said the new model would be based on a dedicated platform distinct from internal-combustion vehicles. That means that the hydrogen-powered crossover utility could become a separate model with its own name, rather than an adaptation of the gasoline Tucson model.